Loulé is the ideal destination for those looking for an authentic taste of the Algarve within a short drive of the famed coastline and golf courses. Take a wander through the Medieval lanes where you will see craft workshops and traditional houses or relax over a glass of wine in one of the tree lined plazas. You can stock up on local produce and fresh fish to cook up a feast at your villa. The daily market is held in the unusual Arabic style market hall or you can meet the producers at the farmers’ market which takes places every Saturday.Loulé is the ideal destination for those looking for an authentic taste of the Algarve within a short drive of the famed coastline and golf courses. Take a wander through the Medieval lanes where you will see craft workshops and traditional houses or relax over a glass of wine in one of the tree lined plazas. You can stock up on local produce and fresh fish to cook up a feast at your villa. The daily market is held in the unusual Arabic style market hall or you can meet the producers at the farmers’ market which takes places every Saturday. Loulé comes alive on Saturday mornings when the daily market expands to include a farmers’ market which lines the streets. There is also the bustling and chaotic gypsy market on the western side of Loulé. Further East and for something more cosmopolitan the large Forum shopping centre near Faro has a wide range of designer shops and why not also visit the Mar Shopping mall with it's designer outlet stores just on the outskirts of Loulé. 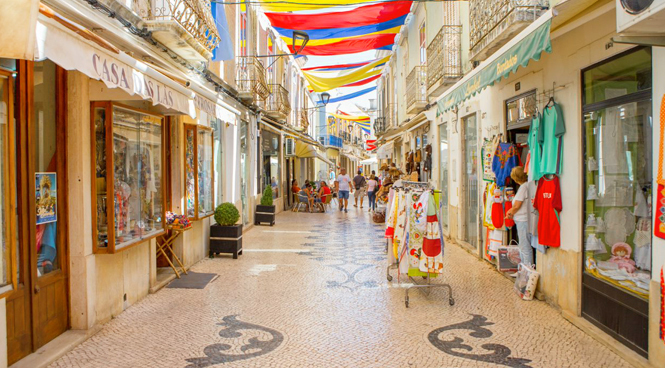 Loulé offers a varied range of Restaurants, cafés and a few bars. Mostly centred along the Avenida and around and beyond the covered market including Café Calcinha which opened in 1929. The closest resort of Quinta do Lago boasts the Bougainvillea Plaza which has a choice of fashionable restaurants and chic shops. Vilamoura to the west is centred around its famous marina and has a large selection of restaurants and bars for a view of the luxury yachts while you dine. There are various beaches to choose from along this coastline which is known as the Golden Triangle. Vale do Lobo Beach is approximately a 20 minute drive, alternatively there is the long stretch of sandy beach at Quinta do Lago or Vale do Garrao. These are just a few of the fabulous sands that stretch for miles along the coast here and at each you will find sunbeds and parasols and places to have a bite to eat. There are lots of opportunities for family outings in the Algarve, ranging from a trip to the Ria Formosa Nature Park to the Aquashow waterpark. Nearby Almancil, is famous for its Go Karting Rink and for something more leisurely, horseriding is available at the Pine Trees Centre near Vale do Lobo. Zoomarine in Guia is a fun day out for everyone. You will be spoilt for choice! Loulé is a historical town founded by the Romans and settled by the Moors with various historical and cultural attractions to visit here particularly the 13th Century castle. Originally an important Moorish city where remnants of this North African heritage can still be seen throughout the town. If you wish to explore further why not also visit nearby Faro's historical old town where you will find marvellously preserved Medieval quarters, museums, churches and a cathedral.